Gina Cayetano of the Municipality of Ibaan is not your typical middle-aged mother and grandmother. For starters, she is lovely and youthful in her looks, something that seemingly belies the fact that she has four grownup daughters and grandchildren. At daytime five days of the week, she is a school principal. After hours, apart from attending to her duties as mother and grandmother, she indulges a personal passion for food and baking that she says she inherited from her grandparents, who used to own a restaurant. 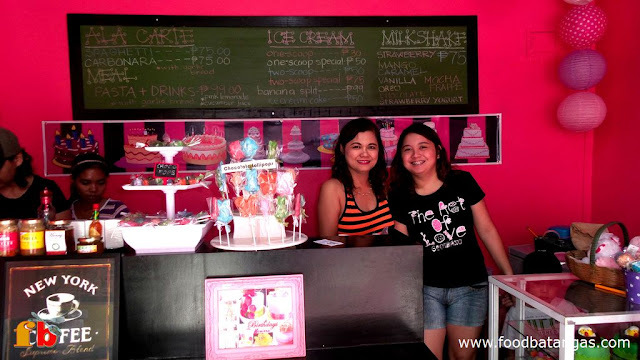 Like the proverbial supermom, she still has the energy left after seeing to her duties at school to open and manage with her daughters a snack bar in Lipa City called the Sweet Bears. The shop, so named after the Goldilocks fairy tale bears’ penchant for sweets, is along the highway in Paninsingin right in front of De La Salle Lipa’s Mabini Building. Gina Cayetano (left) with her youngest daughter Giselle. Although the shop is open to walk-in customers and offers pasta, milk shakes and ice cream, it also serves as the face for a burgeoning made-to-order cake business. Customers can walk in to place and collect orders or pick up orders earlier made online. In fact, it was an online cupcakes and fondant cakes business called Pink Sweets, started three years ago by Gina’s daughter Clarence, that Sweet Bears can trace its roots back to. Giselle, the youngest daughter, picked up the cue from Clarence and started her own online business called Purple Sweets. Beyond cakes, Giselle has diversified and also sells homemade pasta and lasagne. 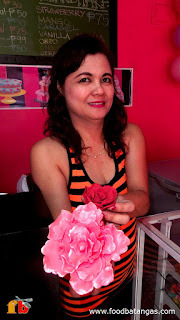 Pink Sweets’ market was originally just Tanauan City where Clarence was based; while Purple Sweets operated from the Cayetano home in Ibaan. As both businesses started to grow, the family decided to open Sweet Bears as recently as April 2015; and on Easter Sunday at that, if ever an inaugural date was always bound to be so fortuitous. The two other daughters also actively pitch in. Frances, the eldest and at her young age already a survivor of open-heart surgery, is the artist who designs many of Sweet Bear’s products. Marian, the second daughter, is a nutritionist employed by a large multinational food corporation but assists in the marketing of the family’s products. These products are painstakingly and lovingly crafted and baked. Gina, for one, says that she does not think of designing and baking cakes as a job but instead as a passion; and can stay up all night working like an artist at her craft during times when orders pile up one after the other. Sweet Bears occasionally partners with caterers to set up candy or dessert buffets. Sweet Bears' cakes are colorful and can be made-to-order. As a business philosophy, the family ensures that all products sold at Sweet Bears are all freshly baked or cooked. 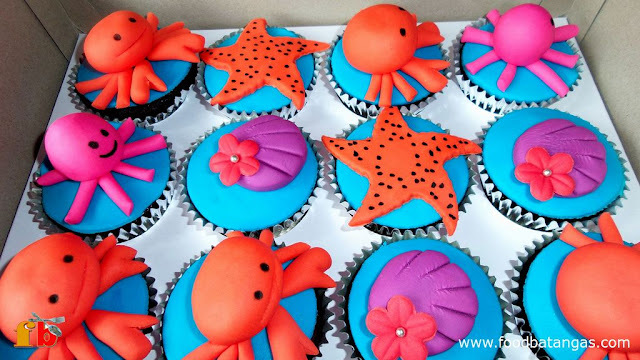 While fondant cake businesses have become dime-a-dozen these days, Frances says that they all try to stay ahead of the competition by ensuring that the cakes that they sell are of the highest quality in terms of taste and freshness. It is, therefore, hardly any surprise that this family business’ reputation has already transcended the originally established markets of both Pink Sweets and Purple Sweets. Customers have come from as far west as Calatagan here in the Province of Batangas and as far north outside the province as Bulacan. It is also not uncommon, Giselle says, for expatriate Filipinos to place orders online for products that they ask to be delivered to their relatives or friends in the Philippines. There are also those who purchase products at Sweet Bears to take along as presents when they fly out to the countries where they are presently based. Gina Cayetano shows off one of her own creations. She also says that cupcakes, moist chocolate and red velvet cakes are their basic products; but they also bake carrot, vanilla and banana cakes upon customers’ requests. They can also prepare dessert or candy buffets, depending on customers’ preferences. Customers can bring along custom designs or choose from a catalogue that Sweet Bears thoughtfully provides. Majority of the cakes sold are for use in weddings, but Sweet Bear also does cakes for birthdays and other occasions such as Fathers’ or Mothers’ Day and graduations. Occasionally, the family also partners with caterers to provide cakes and desserts. Of course, Sweet Bears is also a snack bar where people can lounge while having some pasta, cakes or ice cream. The shop also claims to be the first in Batangas to offer honeycomb ice cream, known elsewhere for its health benefits. Students, in particular, will have more reason to linger because wi-fi connection is available. The food, needless to say, will always be the shop’s main attraction, cooked and baked as it is by Ibaan’s family of baking girls with the passion and commitment that those in the culinary industry know are as important as culinary skills for a food business to succeed. For those who wish to inquire or place orders, Sweet Bears may be reached through its landline 63-43-7740461. Office hours are from 8am to 8pm Mondays to Saturdays.